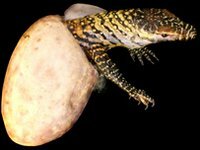 My brother sent me a very interesting link about some lizards that reproduced without any male contact. Tests revealed their eggs had developed without being fertilised by sperm - a process called parthenogenesis or asexual reproduction. This phenomenon is definitely a exception to the rule laid out in the Quran (ayat shown above) in Sura Luqman (31:10 & 11) viz all creatures have been created in pairs for the preservation of species. 10 He created the heavens without any pillars that ye can see; He set on the earth mountains standing firm lest it should shake with you; and He scattered through it beasts of all kinds. We send down rain from the sky and produce on the earth every kind of noble creature in pairs. 11 Such is the Creation of Allah: now show Me what is there that others besides Him have created: nay but the Transgressors are in manifest error. 45 Behold! the angels said "O Mary! Allah giveth thee glad tidings of a Word from Him: his name will be Christ Jesus the son of Mary held in honor in this world and the Hereafter and of (the company of) those nearest to Allah. 46 "He shall speak to the people in childhood and in maturity and he shall be (of the company) of the righteous." 47 She said: "O my Lord! how shall I have a son when no man hath touched me?" He said: "Even so: Allah createth what He willeth; when He hath decreed a plan He but saith to it `Be' and it is! I remember Shaikh Deedat clicking his finger and saying "for Allah to create a million Jesuses without a father just like that". May Allah guide us all ! Posted by Arshad on Saturday, December 23, 2006.